Who doesn't love a little Hummus, Tzatziki Dip or Pita Chips? Cedar's Foods brings you these delicious products plus more! Check out Sweet Cheeks and Savings' review of Cedar's Foods HERE! Now that we've told you about the product... Let's get on with the giveaway!! 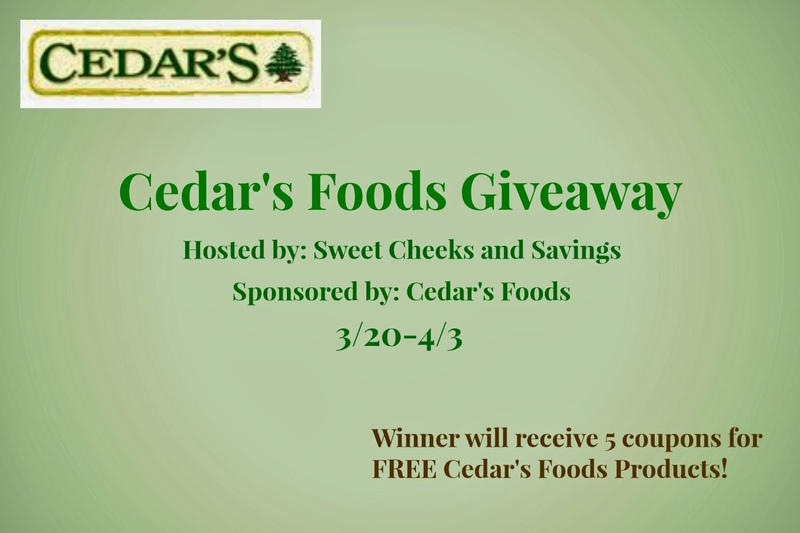 Prize: Winner will receive 5 coupons for FREE Cedar's Foods Products. Dates: Starts March 20, 2014 12:00 am EST. Winner will be chosen April 3, 2014 11:59 pm EST. **Special Note: Open to US only. Disclosure: Sweet Cheeks and Savings teamed up with Cedar's Foods for this giveaway. Other participating bloggers are not responsible for choosing the winner or shipment of product. They have not receive any compensation for this post. I like them on pretzels and pita chips. I love hummus with pita bread, chips or as a dip for veggies, thanks! I love hummus as a dip with fresh veggies, pretzels & pita chips and also as a spread for pita sandwiches.